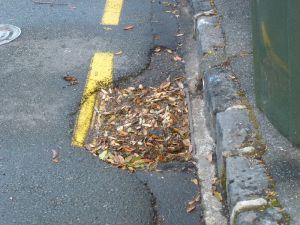 attached is the reason why there was flooding, I went passed this spot on the howick & eastern bus about 9am Sunday morning after the big rains had stopped the flooding was at least 1/3 way across great south road, since most of the buses now have radio contact with their base, it surprises me that the base does not have a "hot line" so they can report it to Auckland City.C. and it can be cleared of the flood before it stops raining. The address is outside 216 not 224 as I reported on this web site yesterday.